Going a month without shopping didn’t exactly go as planned on the sartorial front, even though I did succeed when it came to housewares and other unnecessary indulgences. There was just something about this dress that I couldn’t pass up during the Net-a-Porter sale. 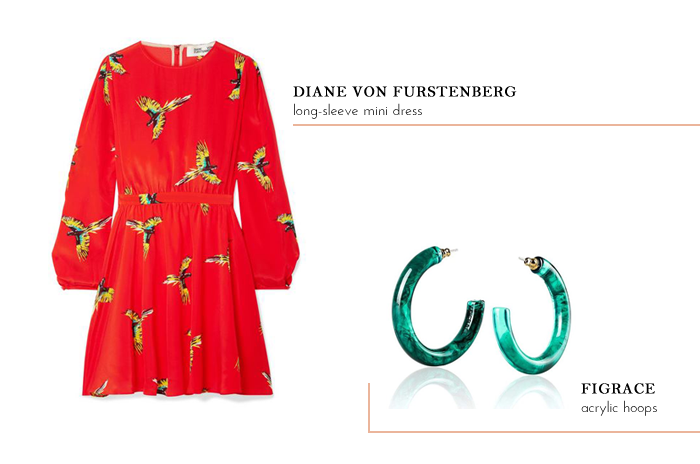 I love fit-and-flare frocks, especially when they’re created from such a vibrant silk with an eye-catching design. It’s one of those pieces that embodies the direction I’d like my wardrobe to go this year: beautifully crafted, high quality, thoughtful, unique, and something that I’m beyond excited to wear. This month’s edited list also made me realize how much happier I am when I pare down my selections to just one or two (or sometimes three) quality items to refresh my closet each month. I think I’m finally past the point where I crave an overhaul of fast fashion each season. That’s not to say I won’t enjoy the cheap thrill occasionally (thus, the earrings), I would just rather save my money and put it toward a better quality item I’ll love for years to come. With that in mind, the one item I have my eye on for February is this gorgeous blouse from Nicola Glass’ debut collection with Kate Spade. I love wearing loose blouses with jeans and this one ticks all of my boxes with a beautiful print, fluid fabric, and a flirty neckline. Figrace acrylic hoop earrings – These are pretty great for $10. They’re substantial, but lightweight, and the emerald green color is gorgeous. This particular pair is now sold out, but you can get these rectangular hoops in green. At this point, a formal budget post gets tricky with how we’re allocating money now that we have a house and we’re adjusting to our new financial plan. As I mentioned last month, we gave each other an allowance of $200 per month to spend on whatever our hearts fancy. Additionally, any blog revenue I earn is going toward my monthly purchases or in a savings account for a splurge-worthy item. It makes a monthly budget fluid and I feel like I need to over-explain where the money came from. So, we’re just going to go back to a monthly wardrobe update for awhile. I still think there’s value in sharing monthly purchases with mini reviews and fit tips, plus I’m nosy myself and they’re my favorite posts to read on other’s blogs! See all of this year’s sartorial purchases here. I round the prices to the nearest dollar amount and reflect any discounts I applied. LOFT garland mixed media cami ($22.25; worn here): I bought this solely to wear with the matching shorts as a practical take on a romper, and I absolutely love how they look together. The front of the cami is made from a woven material and the back is a lightweight jersey, which is a little weird and I would have preferred that the fabric on the front continued around back. However, it wasn’t a deal breaker for me. It runs large with the swing shape throughout the torso, but you’ll want to opt for a size that fits your bust so that it lays correctly. LOFT garland fluid drawstring shorts ($24.75; worn here): These have a wonderful silky material with a nice drape and weight to them. They also run large, so you’ll definitely want to try a size smaller. They get a little wrinkly when you’re sitting on them throughout the day, but the print camouflages it. Loeffler Randall tassel pouch in melon leather fringe ($100): I bought this during Loeffler Randall’s end-of-season final sale. The fringe leather is unlike anything I own, making it a unique piece to add to my collection. 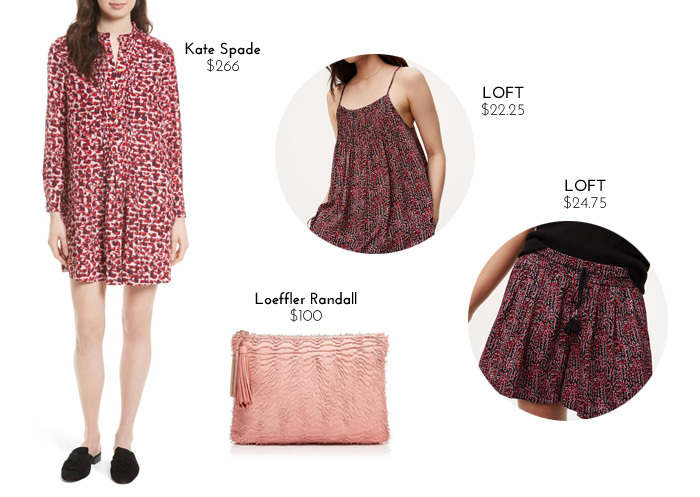 Kate Spade brushed silk swing dress ($266): This dress is my only Nordstrom Anniversary Sale purchase and I can’t say enough good things about it. I almost didn’t spring for it, considering the price point is still high and we’re feeling strapped for cash right now. (Houses are not cheap!) But I hadn’t found a dress that seemed so “me” in a long time and I loved that this had a short, loose shape with long sleeves. I ordered it thinking that I could easily return it if I wasn’t as enamored in person, but it turned out to be as lovely as I imagined it would be. It looks adorable with bare legs and flats for fall and it’ll continue into winter with tights. Go with your regular size, even if you have wide hips like I do. There’s plenty of fabric to skim over your hips so you can go with the correct fit on top. As always, I want to be transparent about what I’ve received from companies for review or as part of a collaboration. LOFT striped wrap maxi dress ($49): I really wanted to love this, but it was way too large on top and kept falling open. I don’t think it would have been such an issue if the dress had adjustable shoulder straps.